Eastern Roman Byzantine walk in baptismal font from the 6th century AD Parish Church of Demna near Kalibia, Cape Bon, Tunisia. 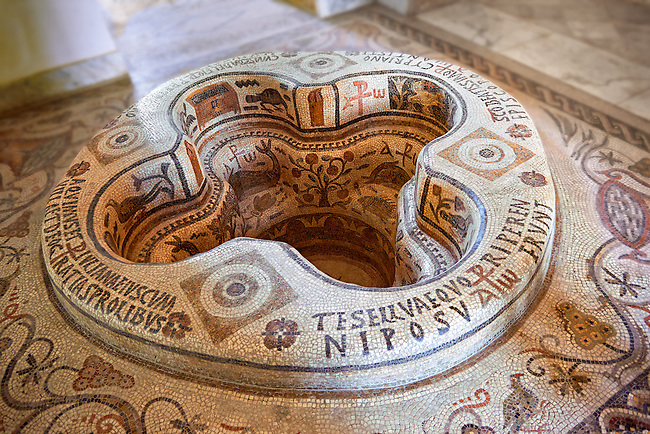 The baptismal font was removed from the church and restored in the Bardo Museum Tunis in 1955. The mosaic iconographic decorations represent the salvation of the neophyte, newcomer, who by being baptised is admitted into the Church of Christ whilst being illuminated by faith, represented the mosaic lit candle illustrations. The P with a cross through it is the Chi Rho, a Christian symbol which represent the first two letters of Jesus Christ's name in Greek. The Christogram also has the Greek letters Alpha and Omega which represent the passage from the book of revelations: “I am the Alpha and Omega" Chapter 1 verse 8, which is clarified by "the beginning and the end" (Revelation 21:6, 22:13). In these type of baptismal fonts those being baptised would have been fully immersed in water as John the Baptist immersed Jesus.